This spectacular antique Saph or multiple-niche prayer rug is a masterpiece of East Turkestan weaving. This spectacular antique Saph or multiple-niche prayer rug is a masterpiece of East Turkestan weaving. Woven with all silk pile, it is luxurious yet elegantly reserved in its design of lobed niches surrounded by a simple vine scroll border system. The spandrels above each niche are different in design and color. The field of the niches in soft green, the color of the Prophet, is used here not only because it is a precious, difficult color to produce, but also as an expression of piety. While this rug has clear signs of wear, it is acceptable given its great age. Indeed, it bears the marks of its long experience like a venerable wise man or warrior. The Oasis cities of East Turkestan (Kashgar, Yarkand and Khotan) weave carpets in a unique style: not Persian, not Chinese, not Turkestan or tribal. Two formats stand out: Kang rugs, about 6.5 ’x 13’ for the heated seating platforms of local houses and multiniche prayer rugs(saphs). Usually made for mosques and later as decorative exports. This silk pile saph has fine ornamented gold, shouldered mihrabs beneath spandrels varying in pattern from one panel to another on this oriental rug: large rosettes and “S” leaves, various semes of small lozeyes and dots. The single salmon border separates the panels and encompasses the whole with a compressed pattern and palmettes as décor. The three main cities each maintain a unique weaving technique. Khotan, farthest east and closest to China proper employs woolen wefts, usually brown and Chinese design motives including the poly chrome rainbow wave border. Spahs are particularly frowned Khotan production. 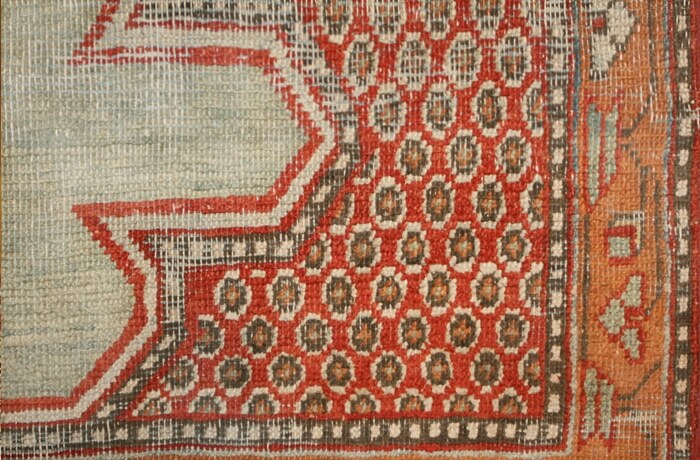 Tackand carpets are generally blue cotton wefted, and open fields with usually three similar medallions and bold reciprocal borders appear on the most desirable examples. Farthest west and most open to Persian influences is Kashgar. The rugs are white cotton wefted and silk is frequently employed instead of wool as the pile material. Metal thread along with sick is used on the most luxurious pieces, usually in Persian inspired all over patterns. All three types are asymmetrically (Persian) knotted. 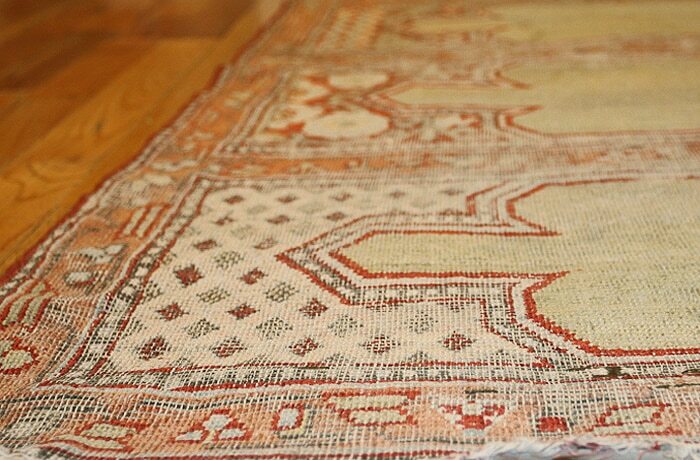 Although our antique carpet has been attributed to Yarkand, a Kashgar origin is probably more likely based on pile material and white cotton wefts. There is no metal thread. The weave is medium and the pile never was particularly long. The niche areas have held up well and most weaves has been in the intervening borders and the spandrels. Importantly, there has been no repair to the plain mihrab areas in this rare period East Turkestan Saph which would make a superb wall hanging tapestry rug for any collector or as an exotic decorative carpet.